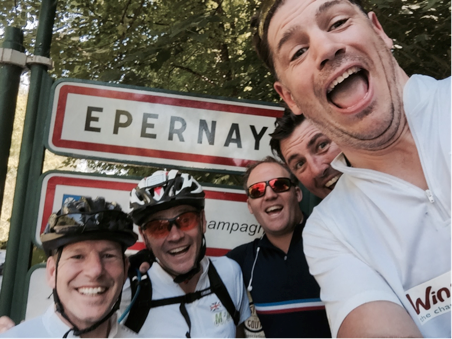 It is a ride they will never forget – a 400-mile cycle beginning at Minety Primary School to Moet (Epernay, France). Fully clad in Lycra, the five members of the Wobbly Wheelers, a group of friends and local businessmen decided to take on a massive challenge that has raised an incredible £13K for Winston’s Wish, Parkinson’s UK, United Foundation, and Minety Primary School. The group who usually only rides 10-12 miles went full out and completed 400 miles in, get this, four days! 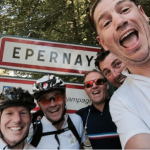 Al Keck, managing director of toinfinity, and Ralph Wells, director of WBM Commercial Property, both based in Swindon, focused their fundraising efforts in the local area, while Joe Lister, Tim Vaughan and Matt Bray fundraising efforts were made further afield. 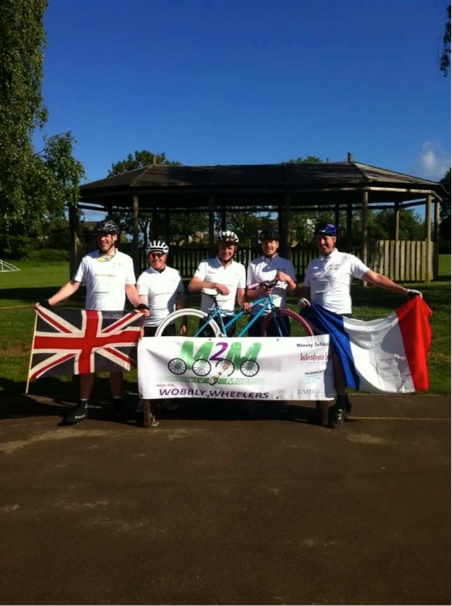 The Wobbly Wheelers would like to thank all those in the local business community and further afield who donated and supported the team. How did the idea of cycling 400 miles come about? Originally it was 1000 miles, Minety to Monaco however, the realisation set in of that many days in the saddle, the time it would take and going over the Alps that a new location needed to be found. As Ralph was the ringleader and his favourite tipple being champagne, it only seemed fitting that we choose Moet, and the mileage looked after itself. 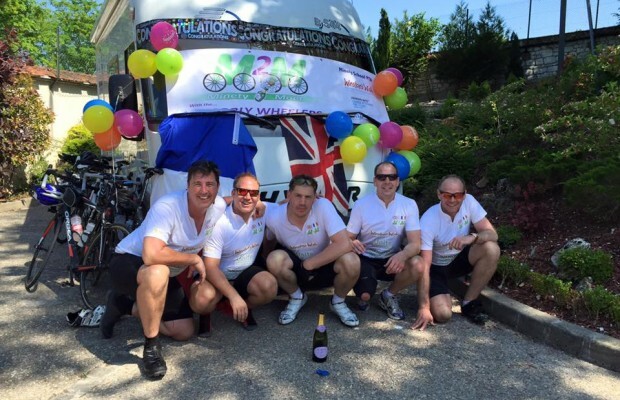 What was the biggest challenge of completing this charity ride? Sitting on a razorblade saddle for 400 miles. Do you plan to do it again next year? Our plan is to make it to Monaco, whether that happens next year, we will see. But yes, the yearly M2M challenge has commenced. How did it feel when you started/finished the ride? When we started the ride, everyone was full of energy and jubilation after a great send off with all the kids at Minety Primary School. The head of the school, Sally Greaves even got in on the action as she jumped on a bike to help see us off with a few laps around the school grounds. The team at Minety Primary School before set off. The end was the same. The fact that we knew that we didn’t have to sit on the saddle and cycle anywhere was nice. And to get into a swimming pool with a beer – euphoric! If you could change any aspect of the ride, what would it be? Find a more comfortable saddle. Did your team have a motto? Not necessarily a motto, but our lynchpin was Tim Vaughan and the games he made us play while cycling. “Who Am I” took many miles of questions trying to figure out which name we had stuck on our helmets. Bart Simpson and Popeye took a long time to get. We have a fantastic team, morale and spirit, and the games helped keep the mood light. Also, you could just look around and see the people who were hurting, help out and vice versa. It was a comradery. We knew how much money we were raising for fantastic charities and the benefit of that. A little pain was insignificant to what we were achieving. Main picture: (from left to right) Matt Bray, Al Keck, Ralph Wells, Tim Vaughan, and Joe Lister celebrating at the finish line in Epernay on June 5th, 2015.